Precise adjustment of the Vertical Tracking of your tonearm is one of the most significant improvements you can make to your listening experience. It is not as difficult as you may be thinking, and costs nothing. You have already paid for your equipment, and though the turntable may have been set up “perfectly” at some time by a dealer, experience shows this is no guarantee that it is correctly and precisely adjusted right now. Parts move with use, and the tightness of fittings can alter over time. In less than 15 minutes, the effect of adjusting, refining the adjustment, and eventually locating the “sweet spot” in VTA – just a turn of the adjuster, listen, turn a little more, listen, turn again until you finally locate it – completely transformed the performance of the system. The stereo sound stage snapped into focus, the troubling bass lifted, harshness was replaced by sweetness, an extraordinary and unexpected experience. The adjustment wheel on an Origin Live Encounter tonearm. Most good quality tonearms will have some sort of equivalent method of adjustment. It turns to raise or lower the tonearm, and holds a grub screw to tighten on the final position. Achieving the correct angle by adjusting the height of the tonearm is critical to achieving accurate groove tracking. Altering the arm height is carried out by rotating the helical screw disc up or down – which alters the angle that the stylus makes relative to the surface of the disc, and thus how well that line-contact stylus matches the ridges cut by the original lathe onto the groove wall. The stylus will ride perfectly in the groove when the arm is perfectly horizontal and parallel to the record surface. Starting with a spirit level and rough-tuning up and down to achieve a fairly level tonearm position, it is then necessary to fine tune the adjustment to locate the very small range in which the “sweet spot” is found. In this case, trial and error found less than a quarter turn of the adjuster identified the huge step change in soundstage and tonal balance as it springs into or out of focus. You have to find that sweet spot! 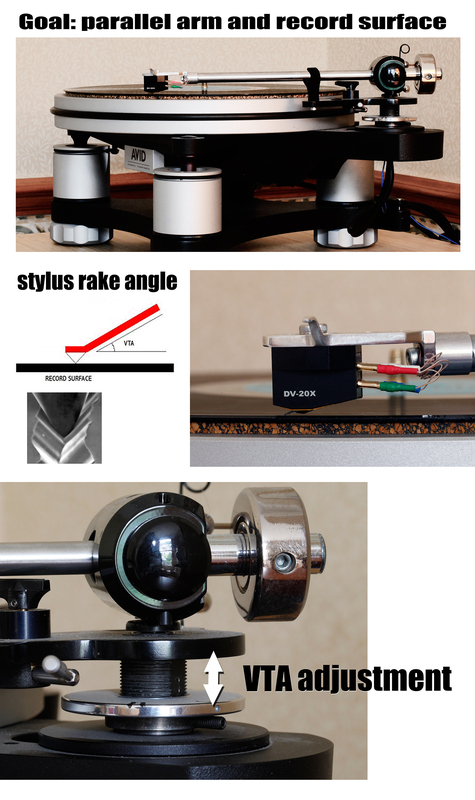 Assuming the (VPI) tonearm to have a 300mm effective length, to get a one degree change of Stylus Rake Angle we need to alter arm height by 5.23mm. A 1.0mm change in arm height changes SRA by 0.19 degrees. The VPI’s VTA adjuster clicks equate to 0.35 thousandths of an inch according to Mr Gregory. That translates to less than one hundredth of a mm. He says that changes of +/-2 clicks produce a “vital” change in sound quality. So once you’ve found that sweet-spot a change of 0.018 mm (2×0.0091) will lose that perfect reproduction. Now just to drive that point home that 0.018 mm equates to a 0.00342 degree change in stylus rake: around three thousandths of one degree! Very small adjustments create very large changes. There should be nothing surprising about that, though it was, as the whole business of hi fi is about massive amplification of microscopically tiny signals. A discernible change in pitch is created by movement in the vinyl wall one thousandth of the thickness of a human hair, detected by the styus sitting in the groove. The angle of the stylus tip determines how much of its surface area makes full contact with the groove wall. As they say, simples. Compare the sound. There are audiophiles who in all seriousness say they can not hear any change resulting from VTA adjustment. For them, with their equipment, and their ears, that is the truth, I have no reason to doubt it. My experience has been of massive change – my equipment, my ears. And I reckon it’s adjustment has been “off” for a very long time, I have no idea why. At the other extreme there are adjustment-addicts who say that you should adjust the VTA individually for every record, to account for changes in vinyl thickness. And they are probably right, though that way madness lies. The improvement in sound has been most noticeable for stereo records. The soundstage has really come alive, and the tonal range sweetly harmonious. That is very good news for the hundred Japanese pressings in the LJC collection.Already I am rediscovering and enjoying my Kings and Toshibas in a new way. So much so, I’ve ordered four more. The other main benefit has been the significant reduction in vinyl surface noise since finding the VTA sweet spot. There is probably some science behind that too, but the effect is most welcome, whatever the explanation. Great Guide – any chance of some advice around adjusting the horizontal axis of the tonearm? Mine doesn’t seem to catch anymore. Hi, I have no special expertise in tonearm adjustment beyond what’s written here, different tonearms have different designs, I’m not the right person to give you advice. one thing not mentioned – that i believe to be true – is that VTA must continually be adjusted to compensate for sag in cartridge suspension over the years… so as to maintain the correct angle for stylus to track in the groove. There is no absolute – it varies from cartridge to cartridge and upon age, etc. Wow, that’s a misleading quote. The author is arguing that such small changes in VTA are NOT significant. He notes that the flatness of not only records but of platters have much higher tolerance, and thus the VTA/SRA is in fact constantly changing as the record plays. He also notes that Dynavector and Clearaudio both make tonearms which are very short and thus will change VTA more radically than conventional arms–so it seems not to be an issue for them. If anything, the issue with changes of “VTA” is one of tracking force and how it changes when you change arm height on certain types of arms. But of course you could just change tracking force directly. I’ll add that changing arm height also changes overhang and thus alignment. PS I own and use a VPI JMW 10.5 so I have direct experience of VTA changes both small and large and I agree with Geoff Husband that they are not all they are cracked up to be. I have a VPI Scout that I bought about 5 years ago. It has the 9 inch JMW Memorial tapered tonearm, with a Dynavector 20X2L cartridge. According to VPI’s installation instructions, the cartridge should be aligned first (with their alignment jig) and all other adjustments should be made afterward. 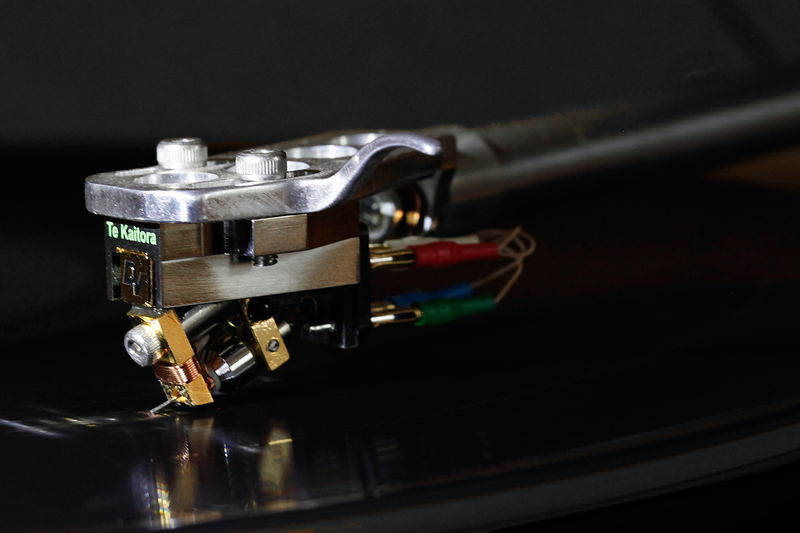 The cartridge screws directly into the tonearm and when tightened is flat against the front of the arm. The only way to change the VTA on my rig is to raise or lower the back of the tonearm. While trying different VTA settings, I kept re-checking the cartridge’s alignment. Changing the VTA did not change the alignment at all. Over the course of several months, I found the sweet spot for most of my records. I also had to take into account the settings on my Sutherland phono preamp. (My Dynavector cartridge is the most recent iteration of the 20×2 model.) It sounds best when loaded at 1000 ohms. This may seem high for a moving coil cartridge, but one reviewer actually claimed he found the cartridge’s best sound when it was loaded at 47k, which is MM territory. I spoke to Ron Sutherland personally, and he emphasized that the correct way to make settings on his phono preamps is by ear. He basically said to forget about the manufacture’s recommendations. Each system is different. Each room is different. Now that I found my sweet spot, I realized that each record could use a different VTA setting. On my turntable, It would be very inconvenient to change VTA settings for individual records. I found that I need to upgrade to a rig with on the fly VTA adjustments. I’m now considering the VPI Prime, which received stellar reviews. There are several VPI retailers that have offered a substantial amount if I trade in my Scout. This would be the only way I could afford to make the upgrade. Evan with the trade in value, I still have to save some money. The only thing I can say is that a vinyl hobby is an unending money pit. I’m just a humble listener, I wouldn’t dare fiddle with these adjustments personally, but I have a friend who is fearless and does. I’m happy to host some pugilism between anyone who wants to fight it out, last man standing is declared the winner. I’ll pour myself another glass and watch. I rather wish I hadn’t started on the VTA subject but it seemed important at the time. Just lowered the back of my tonearm so now it looks completely level. What a difference! The instruments sound more up front and have greater clarity. Much less volume is needed. (And I was thinking of buying a better cartridge.) I don’t hear the small scratches. The low end doubled in output. This is no exaggeration. It’s simply amazing. I don’t know if I have the sweet spot but I previously had the wrong spot. Thank you, LJC, for the superb analysis and clear explanation. I’m so grateful, I just want to play records all night. Seth, I understand your bliss, but it isn’t the tonearm but the cartridge that should be level (see Michael’s post on July 21, 2013, just below). Anyhow – if it sounds good it IS good. The thorny question is if small changes in VTA make such a large difference in sound quality, what does one do with thicker records? Having to reset the VTA constantly is not practical. I should probably set it for thin vinyl because I have more of those records. But then, I have a few thick BlueNotes. I’ve thought about using a record mat for my thin records. Surely the criteria is for the cartridge to be parallel, not necessarily the arm? Different arms, different settings. Yes, no? You may be right, I don’t know. Getting the arm parallel is for initial trueing up. Beyond that, the final adjustments – within a half to a quarter turn one way and the other – are made entirely according to what sounds best, which is the goal. Michael is right, but since VTA also depends on the pressure applied to the cartridge, fine-tuning “according to what sounds best“ is not a bad idea. Absolutely. I’m far from being mainly devoted to Jazz, but have quite a few records from quite a few sources, and take the “arm parallel to record surface” advice as a starting point. I adjust VTA/SRA while playing a record on my Well Tempered Amadeus, as it quickly became a necessity rather than a “tweak”. Thank you for some very interesting and well written pages. Hi and Welcome. I have spent the last few years with a Dynavector DV20HX cart and it definitely benefited from fine adjustment of VTA, and also benefitted from an in-line mono/stereo switch. I am sure the principle of adjusting per record is right, though I’m not sure I have the enthusiasm to do it with the current tonearm. I don’t claim to understand why, but my new cart, the Dynavector TKR with a different type of stylus – Pathfinder line contact stylus – seems to “do the right thing” for itself, without need of much tuning. The new cart deserves a better tonearm – my sights are set on an SME. But first, a custom built valve phono stage is under construction. Exciting. I’m a man who picks up the soldering iron by the wrong end but I have a friend Man-in-a-Shed who has been modding things for 35 years. The custom build is by kit builder Mathew Snell’s World Audio Design http://www.world-designs.co.uk/ but everything inside is specified by Man-in-a-Shed – which valves and capacitors, built in mono switch, the whole guacamole. They are all custom built too. Apparently half the entire UK economy is being diverted to this project. Delivery late June, full write up will follow. The key to this is introducing a valve stage into an otherwise digital amplification system. The Dynavector Te Kaitora Rua , the Beast from the East, pictured in action. The transformation from “high-end” MM to high-end MC cart was totally astonishing, but I believe hearing that result does depend on everything else being at a similar level of quality. My role is just to listen to it. Great pic of the TKR, thanks! That short cantilever could be part of the equation we’ve been discussing. I’ll be very curious about your phono amp impressions.